It’s been dubbed the “Putin list” — the names of 210 prominent Russians, many with close ties to the Kremlin, released by the US Treasury Department. The list, which the US administration had been required by law to release, includes 114 senior political figures and 96 oligarchs, all of whom rose to prominence under Russian President Vladimir Putin. The administration was required to name the companies and individuals and consider whether to sanction them under legislation meant to punish Russia for its interference in the 2016 US election, as well as its human rights violations, annexation of Crimea and ongoing military operations in eastern Ukraine. 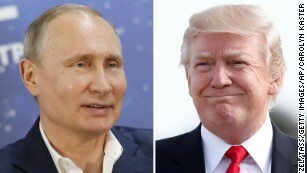 The list, which includes senior members of Putin’s Cabinet and Chelsea Football Club owner Roman Abramovich, reads like the US has “simply rewritten Kremlin’s phone book,” said Russian senator Konstantin Kosachev in a Facebook Post. The US State Department defined oligarchs as individuals with an estimated net worth of $1 billion or more. Thank you for your kindness. I have a feeling that Mr. Trump , his sons and Mr. Kushner are deeply involved in these things also, especially in their Russian connections. I am going to check out your info and I thank you for taking of your time to leave the comment. I appreciate you.